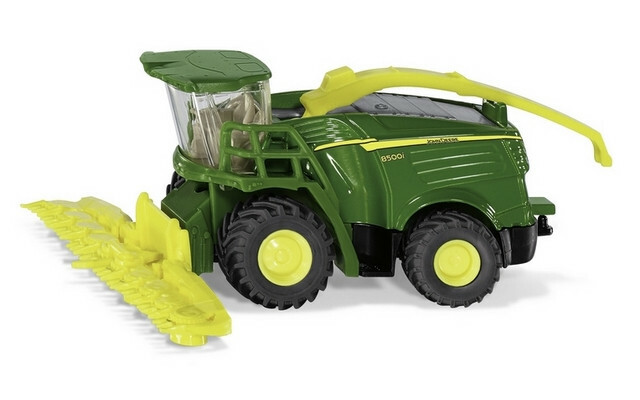 Meter by meter, the imposing John Deere 8500i forage harvester munches its way through the corn field. SIKU has set the scene with the new, accurate 1:87 high-grade metal and plastic version of the model in the 8000 series. The large, powerful, rubberised wheels with the lug treads make their way even over adverse ground conditions. The details delight the make-believe farmers. The corn header can be removed and folded up for transportation to the next corn field. The tank discharge pipe, which can be used to load the harvested corn onto the waiting agricultural trailer, can also be moved.